© Doug Mills/The New York Times President Trump and Kim Jong-un at their summit meeting in June. They have exchanged warm words ever since. For seven years, Kim Jong-un has pursued an in-your-face strategy for building his nuclear arsenal: detonating blasts underground and firing missiles into the sky, all to send the message that his country’s nuclear buildup is irreversible. Mr. Kim’s new forbearance has helped keep a stream of warm words coming from Mr. Trump. A week ago, the president praised Mr. Kim, with whom he says he has forged a special relationship, after the North Korean leader refrained from parading missiles down the streets of Pyongyang during a military celebration. On Tuesday, President Moon Jae-in of South Korea will visit the North Korean leader in Pyongyang for their third meeting, and over three days the two men are expected to discuss a “peace declaration” that the North has said must precede any further discussion of disarmament. 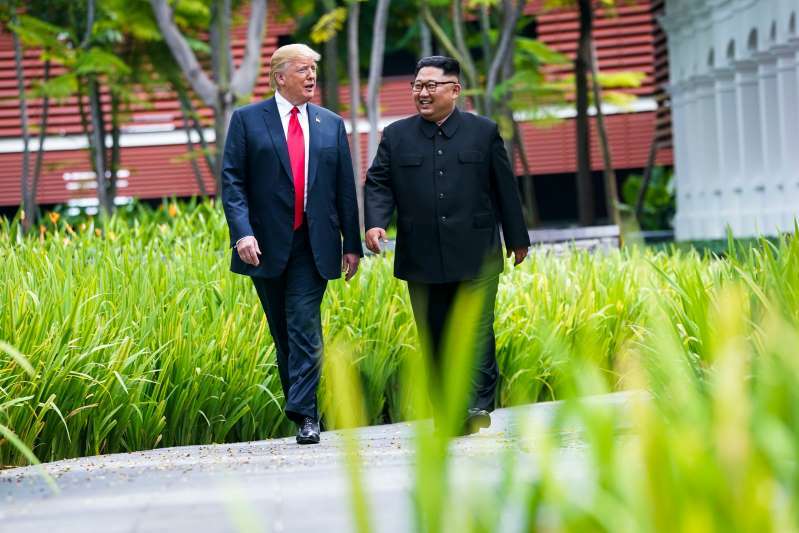 Looming over the meeting is the post-Singapore stalemate on progress despite Mr. Trump’s new tone of accommodation, including his openness to a second meeting with Mr. Kim. After declaring a year ago that Mr. Kim had to disarm quickly or face “fire and fury,” Mr. Trump now says there is plenty of time. But even some of the president’s top national security officials privately concede that Mr. Trump’s declaration in June that “there is no longer a nuclear threat” from North Korea was a huge error, because it was taken as a signal by China and Russia that the crisis was over and that they could resume trading with the country. Even one of Mr. Trump’s frequent defenders, Senator Lindsey Graham of South Carolina, indicated on Sunday he was worried that the president might have been manipulated. The White House argues that significant progress has been made. Mr. Trump’s press secretary, Sarah Huckabee Sanders, has cited the fact that Mr. Kim’s last missile and nuclear tests were 10 months ago, and insisted that is a sign of Mr. Kim’s willingness to deal. It certainly is a constraint on his program: As long as the North conducts no tests, it cannot demonstrate that it has designed a warhead that can survive the huge stresses it would undergo in flight. That leaves ambiguity about whether it can actually strike American cities. Still, nuclear production continues unabated, satellite photographs and other evidence suggest. Secretary of State Mike Pompeo has not persuaded the North Koreans to turn over an inventory of their major nuclear facilities and materials, much less declare how many weapons they possess. While Mr. Kim has blown up entrances to a nuclear test site and appeared to start dismantling a test stand for missile engines, he has not allowed in any inspectors to determine whether the actions were simply for show. Mr. Kim has said a peace “declaration” that formally ends the Korean War must be a first step, and Mr. Moon has privately urged the United States to provide that assurance. The North Korean leader believes that Mr. Trump committed to such a declaration on the way to a more formal peace treaty. But both Mr. Pompeo and John R. Bolton, the national security adviser, have said progress toward denuclearization must come first. “Kim understands what has protected the Pakistanis,” said R. Nicholas Burns, the under secretary of state for political affairs during the George W. Bush administration. The appeal of the Pakistan model is clear. Pakistan suffers few sanctions for its nuclear program, or its refusal to sign the Nuclear Nonproliferation Treaty. It has not tested a weapon in 20 years; like North Korea, it has concluded that it has already proved its basic capabilities. The same is true for India and Israel, the other nonsignatories of the treaty. The United States has “called an urgent United Nations Security Council meeting for Monday at 10 a.m. to discuss the implementation and enforcement of U.N. sanctions on North Korea,” according to a statement from Ms. Haley’s office. But she has little leverage. As long as Mr. Trump declares that the crisis is over, China and Russia will look to maintain the status quo. Whether they do see each other soon depends largely on the initiatives of Mr. Moon, the South Korean president, during his trip to Pyongyang. He has emerged as the most important actor in this nuclear dance, and he sees his role less as an American ally and more as a critical intermediary. He is concerned, one senior South Korean official said, that if Mr. Trump loses the House or feels more pressure from the special counsel investigation, he may veer toward resuming threats of military action. So when Mr. Moon met with his cabinet on Tuesday, he did not talk of “complete, verifiable, irreversible denuclearization,” which used to be how the Trump administration described the goal of talks with North Korea. Instead, he talked about greasing the diplomatic gears.